Izzy and Trent have known each other for yonks. When Izzy’s beloved brother dies in a tragic accident at the local auto mechanic garage, she needs someone to blame. For her, the most convenient vessel for that grief and anger is her Trent. At it’s core, this is a story about how grief can warp our reality, and how we need folks that we trust to help us reconstruct. Trent has loved Izzy for a long time, and the strength of his love is what carries the story. It’s a quiet book, there’s not a lot of action, or drama, but it’s aching. It’s slow and frustrating and Izzy is often infuriating; much like I’m sure she would be if she was my friend and I lived in Templeton Cove. This story didn’t completely work for me, largely because I don’t care for this much angst in my SuperRomances, but I can appreciate Izzy’s choices and can understand why Trent sticks around, even when she’s back-and-forthing him to near death. Brew yourself a cuppa tea to go with this one, imagining the howling British wind across the cove. 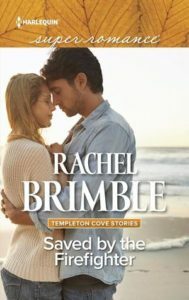 The rest of the Templeton Cove series. Trent loves Izzy for a long time in this one without her loving him back. If unrequited love scratches your itch, check out this list. I received a copy of this one from Tasty Tours in exchange for participating in the blog tour and providing an honest review. Thanks!